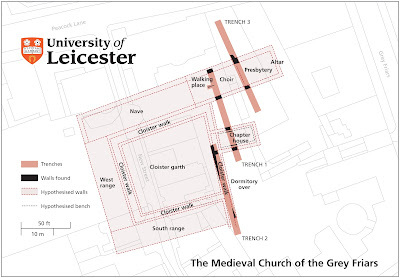 Leicestershire History | News and Features: Where did they find King Richard III? After all the excitement of yesterday with the potential find of King Richard III under a Leicester City Council car park in, I though you may be interested to see the map of the area, to see the layout of the church uncovered by University of Leicester archaeologists. The skeleton in question was found at the beginning of the choir, the place you would expect to find the body of a slain king - the most prestigious location for such an important figure. The picture below shows where the king has been lying for the past 500 years. The yellow dot is where his feet were and his head was located at the bottom edge of the trench (bottom of the photo). 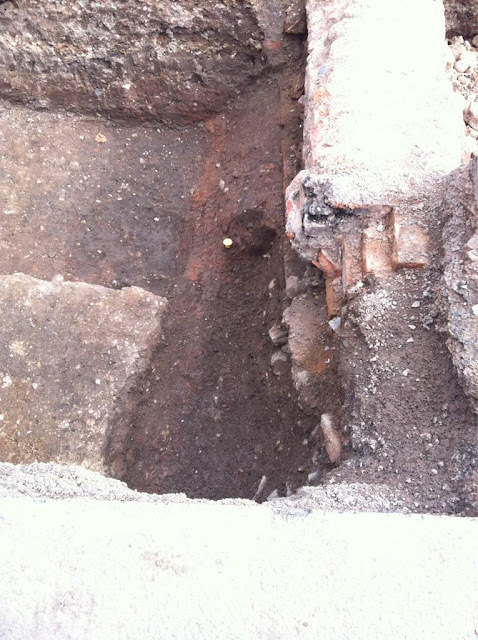 The fully articulated skeleton was discovered by site manager, Matthew Morris, on the first day of the dig. He said: "I found a leg bone, but the problem was that a lot of human remains get churned around when they have been in the ground a long time, so we had to be careful not to damage any other parts of the skeleton while we were excavating. "Even when we'd found it, we hadn't identified the church or anything else which might point to the fact it was Richard III, so although it was exciting I didn't want to get myself carried away." The University of Leicester had to apply for as license from the Ministry of Justice to remove the bones. They are now undergoing laboratory tests at an undisclosed location.